Turmeric is curcuma longa that belongs to the ginger family, zingiberaceae.It is is used as a spice as well as natural dye. The colour, turmeric yellow is due to the compound curcumin. The compound is slightly acidic in nature due to the presence of hydroxyl groups. This acidic compound does not undergo any interesting molecular change in an acidic medium, but it does undergo a change in a basic medium. 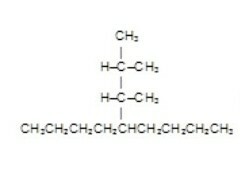 Phenolphthalein, a colourless acidic compound resembles this substance in this aspect. Both turmeric and phenolphthalein do not undergo any colour change in acidic medium; but in basic medium, turmeric becomes red or reddish brown and phenolphthalein becomes pink. Methyl orange is another similar substance but basic in nature. It gives no colour change in basic medium, but becomes pink in acidic medium. Slaked lime is nothing but calcium hydroxide which is basic in nature. Hence when it is added to turmeric powder it becomes red in colour. When any acidic substance is added to this red coloured turmeric, it becomes yellow. lemon which contains critic acid, can be tried for this.